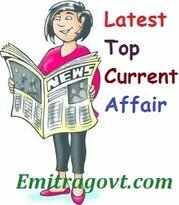 Current Affairs Question 2017: Looking for 29 August Current Affairs? Then start your Quiz right now by answering them. Here in this article, we are giving the Current Affairs Quiz with Questions and Answers. As many people are preparing for various government exams it became mandatory for them to get a grip over the current affairs as in most of the tests are based on Daily Current Affairs. By taking this kind of Current Affairs Quiz candidates can eventually get hold of what they have been working on. Contenders can trust us as we will update all the latest Current Affairs in this quiz. For more such quizzes check our site Emitragovt.com regularly as we will update the Daily Quiz for current affairs. 1. Sports Minister Vijay Goel has announced that the first edition of Rural Games or Gramin Khel Mahotsav will be started from Delhi. It will take place from 28th August to 3rd September 2017. 2. R Surender Reddy has been unanimously re-elected as Chairman of the Hyderabad Race Club (HRC). 3. Indian Overseas Bank (IOB) defeated Kerala State Electricity Board (KSEB) 77-66 in the inaugural match of 53d All India Basket Ball Tournament for PSG Trophy for men. 4. Realty major DLF has entered into a joint venture with Singapore’s GIC to build rental assets in India. It is the biggest deal in the Indian real estate sector. 5. External Affairs Minister Sushma Swaraj inaugurated the first ‘Videsh Bhavan’ in Mumbai. 6. The Insurance Regulatory and Development Authority of India (IRDAI) has launched a Central Database `Envoy’ of all Insurance Sales Persons in the country. 7. The Under-15 Indian football defeated Nepal 2-1 to win the South Asian Football Federation (SAFF) Championship. 8. External Affairs Minister Sushma Swaraj will travel to Colombo to participate in the two-day Indian Ocean Conference to be held from August 31 in which Sri Lankan prime minister and president are among key speakers.